The future is looming with cutting edge architecture and the most revolutionary designs of all are the reinventions of the traditional museum. These buildings of cultural collections are now becoming pioneering visionaries for the future. As we progress into the future it’s becoming more apparent that society needs new museums to keep up with the rapid rate of growing history we're making, especially with our developments in technology and science. In the next five-ten years we will see an evolution in the long-standing museum, with a great number of space-age designs already set to be constructed all over the world – from Budapest all the way to Miami. These buildings are defining the future of architecture and museum culture. Architectural plans of planned museums present an overarching movement of high tech modern architecture, integrating organic structure with technological advancements - the modernisation of society. These building techniques, which are not prevalent in past museums take into account 21st century culture where modern architects are redefining traditional museums with never before seen designs that will create decadent landmarks for the future. ’s redevelopment of New York’s Whitney Museum is set to open this year. The 200,000 square foot space resides in the meat packing district bound by Washington Street and Gansevoort Street. The architecture of the museum responds to the industrial character of the neighbouring loft buildings and overhead railway while asserting a contemporary, sculptural presence. The Whitney Museum is a mix between urban suitability as it responds to its outdoorsy vitality and a fusion of powerful sleek modern, industrial structures where the design steers clear from the time worn columns museum gallery look. has recently unveiled their plans for a high-tech new museum that is set to become a talking point for tourists and residents alike. Plans for the Museum of the Future show a ring-like building covered in Arabic writing. Dubai officials are hoping that it will serve as an innovation hub for budding scientific and technological entrepreneurs. Due to be completed in 2017, the $138 million museum will feature technological advancements from cars, robots, drones and holograms. have truly created a cosmic museum design that heavily channels all things astronomical. The building is to consist of three “celestial bodies” in architecture form: The Occulus, The Inverted Dome and The Sphere – however these three buildings are not just metaphors, they are set to house spaces specially designed to bring the public closer to figuring out the mysterious nature of space. Due to be completed in 2018, the Planetarium is set for construction on the coast of the East China Sea.
. The $300 million museum that sits on a Chicago lake front and it was architecturally designed by Beijing-based architect Ma Yansong. In the plan the architect features a curved building centred on a colossal narrow structure that winds through the landscape. From an aerial view this futuristic design presents itself as a floating disc above nature. With plans for the museum to be completed in 2019 the structure technologies undoubtedly making it a future landmark for Chicago. 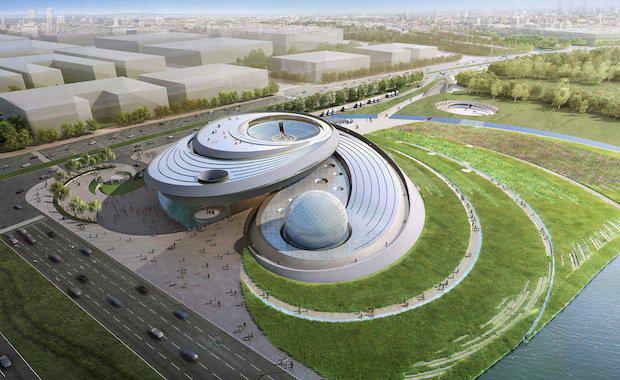 (MOSF) by M.A.A.P Architects will be the world’s first comprehensive science fiction museum. The development which will take place in Washington D.C has begun with a small preview version spanning out 3,000 square feet in order to test exhibit concepts and interactive technologies. The full scale facility is scheduled to open in the next 5 years, defining 2020 with architecture from outer space.